Founding Partner of Power Iluminare, Eduardo Riguero Escoto, and Founding Partner of Fortius Electromecanica, Sergio Alcalde Delgado, Unveil Historic Public Lighting Plan. ZAPOPAN, Mexico, May 17, 2017 /PRNewswire/ -- Power Iluminare has recently joined efforts with Fortius Electromecanica to create a joint venture to supply public lighting for the next 18 years to Zapopan, a city with a population of 1.2 million. The contract for the project has a net worth of more than USD $238,751,010 and will include the installation, maintenance and operation of over 70,000 streetlights. "We are creating a smart, affordable eco-friendly infrastructure that will bring public lighting through sustainable power to the municipality of Zapopan, Jalisco," said Mr. Eduardo Riguero Escoto, Founding and Main Partner of Power Iluminare, SAPI de CV. "This new project represents our steadfast commitment to Mexico's energy reform by diminishing the energy consumption of Zapopan, delivering energy efficient lighting for the benefit of our community, our security, our environment and the economy." The Public Lighting System of Zapopan will not only have eco-friendly LED street lights which will reduce energy consumption in the municipality, but also produce zero carbon emissions since its energy will be supplied by a new plant, created by Mexican developer and partner of Power and Fortius Electromecanica, Fortius Solar, which recently completed its "Jalisco 1" project, a solar orchard dedicated to the production of photovoltaic (PV) energy. These two projects combined represent a global reduction of 10,090 tons of CO2 per year or a U.S. equivalency of 168,316,667 sq. ft. of emissions per year, the approximate size of 60 Empire State Buildings. According to Mr. Eduardo Riguero, this joint venture is the first in a series of long-term projects. "We are pleased to announce our plans to provide solar power to fuel the Public Lighting System of Zapopan and the private sector for the next 18 years." 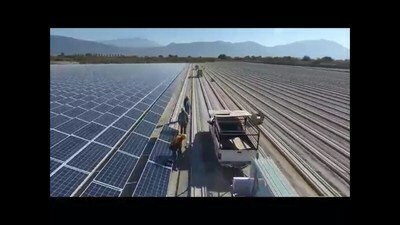 The visionary Mexican partners have also recently entered into a partnership with Tesla Motors' SolarCity and will begin construction on a second solar farm adjacent to Jalisco 1. "As Mexico prepares to meet future energy demands, it must invest in eco-friendly technology and sustainable energy projects that help stabilize the cost to consumers and make it available to a greater number of households," says Mr. Eduardo Riguero. "Also important is the positive economic impact of projects such as the Public Lighting System of Zapopan and Jalisco 1, which will provide more than 200 jobs for their installation, management and operation." Already gaining widespread notice, Jalisco 1 was named 2017 MIREC Project of the Year. The MIREC Award was presented to Fortius Solar, under the leadership of Sergio Alcade, and partners Alion Energy and Trina Solar for developing a project located in Mexico that has pushed the boundaries of excellence in the renewable/clean energy industry.